Steve Draper was born in the City of Martinsville in 1953, and has resided in the city for his entire life. Steve attended Martinsville High School, graduating in 1972 and attended classes at PHCC and ETSU. He began working in the Sheriff's Office in 1973 where he worked as a Correctional Officer in the jail, a court bailiff and as a civil process server/transportation officer. He entered private industry in 1980 as a Safety/Security of Pannill Knitting Company which was purchased by Sara Lee Corporation. While employed by Sara Lee, Steve continued achieving management/supervision training. Steve has served the citizens of the City of Martinsville in several capacities. He joined the Martinsville Volunteer Fire Company in 1971 and continued to be active with them until the early 1980's. In addition, he joined the Martinsville Henry County Rescue Squad in 1979 and served the community as an EMS provider for approximately ten years. He served as president of the Martinsville Volunteer Fire Company and Captain of the Martinsville Henry County Rescue Squad. Steve has also worked at the Martinsville Speedway since 1971, where he continues to serve as Director of Security and Event Coordinator. In 1991, Steve was elected to the Martinsville City Council where he served until being sworn in as Sheriff on January 1, 1994. Because of his experience and expertise in the Criminal Justice field, Sheriff Draper has been elected/appointed to serve on several corrections/criminal justice related boards/commissions. 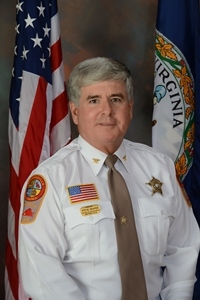 He has served as Chairman of the Piedmont Criminal Justice Training Academy, President of the Virginia Sheriff's Association, Governor's appointee to the Governor's Motorcycle Safety Council, Virginia Division of Motor Vehicle's Fraud Commission, Virginia Supreme Court of Virginia's Pandemic Flu Preparedness Commission and serves on the Virginia Department of Corrections' Liaison Committee. Sheriff Draper continues to serve the community as one of the organizers of the annual Fun Fair, The Virginia State Police Help Eliminate Auto Theft (HEAT) program, and assist with the Martinsville Henry County National Night Out events.